Mahmud Rahman concludes his insightful series by addressing your questions and responding to the discussion he sparked. Read all posts in Mahmud Rahman’s investigation here. In this final post, I want to respond to some issues that have come up among readers. Besides a few comments on the blog posts, this series also generated conversations that came to me via personal emails or messages on Sasialit, a mailing list about South Asian literature. I appreciate the insight you give about the lack of institutional support/interest both in the U.S. and in India (at least for translations to the U.S.) but I am curious about the question of audience, which I don’t think you’ve addressed in-depth yet. In your second article you noted that South Asian novels aren’t really widely taught and that the audience for the translations would be a small audience of academics—I’m curious then, who is the audience for translations in general (not South Asia-specific)? Even if other literatures do get translated more into English, is it still for a small academic audience (smash-hits aside)? And does the audience really dictate what academic/smaller presses publish? If the collective audience for South Asian translations are academics, who will already go out of their way to pay attention to and seek out these books, is there significance in introducing six or ten more translations per year? Especially if the author already had a huge following in his/her home country. There is a fair body of translations available now; in fact, it is hard to think of a major modern writer from India whose work is not available in English in some quantity. Rather, the trouble is that even the best of these writers are hardly known and read beyond a few South Asia departments in a few universities. Sometimes, even that is for the ‘wrong,’ i.e., nonliterary reasons. Anathamurthy’s Samskara is read in the departments of Anthropology or Religion, as he complained, and the umbrella term ‘South Asia’ itself is rather less about literature and more about geopolitics. The question to ask, perhaps, is not why there are so few translations but why even those that there are are so little read. If a larger readership were to emerge, more translations would follow automatically? It is true that at present, South Asian translated literature is mostly read in college courses; in my second post, I had noted that the readership issue in academia is complicated. Right now, most translations are read in small classes, not larger lectures, and it is often difficult to acquire these books from India in bulk (though this could change with the increased use of e-books). It is a circular problem. Only if there were larger courses teaching translated literature might there be greater demand, demand that would need some kind of response from publishers. On the other hand, if more books were available—and when awareness of such titles grows—such books might more likely be assigned. There are no signs yet that anyone is taking on this challenge. But what about a readership outside academia? I believe there is potential here. Like many others, I got introduced to translated literature in school and college, but that reading habit continued into my life afterwards. Indeed, an introduction to South Asian literature in translation in a course might lead to an interest that persists past college. 1) Euro Crime and Thrillers—your Stieg Larsson, Henning Mankell, Jo Nesbø, Joel Dicker. 3) International Reader’s Choice—this is the category of The Elegance of the Hedgehog, Herman Koch’s The Dinner, Jonas Jonasson’s The 100-Year Old Man Who Climbed Out the Window and Disappeared, Kyung-sook Shin’s Please Look After Mom, and farther back, books like Like Water for Chocolate. I’m not sure what crime fiction or thriller titles are waiting in the wings from South Asia. If there are, publishers might readily come forward. As for a literary brand around an author, that takes time to build. However, there is that tantalizing third category. It seems to me that lately there is a wider interest in translated literature. This may reflect what media I pay attention to, but it appears that in recent years, numerous literary blogs and journals have appeared where translated titles are featured and discussed. We have left behind the time when such discussions were limited to academic journals. If some translations from South Asia enter the conversation in these new literary spaces, we might see a growth in readership. Of course, some publishers have to be willing to take risks and test the waters. There would also be a need for innovative marketing strategies. I am eager to see the response to the several translations from Urdu/Hindi that have been published in the U.S. over the last couple of years (discussed in Part II). In my first post, I had collated some opinions on why translated literature from South Asia has not been successful. Some of them pointed paradoxically to the success of South Asian literature in English. In continued conversation on the topic, some readers offered additional reasons. My own hypothesis is that Western readers are seldom interested in literature that comes out of a non-Western sensibility or is not already tailored to their cultural expectations. The three major instances of literature in translation making it big in English in the 20th century have been the Russian novel, the Latin American novel and the East or Central European novel. All were already ‘Western’ in terms of civilization and sensibility. And a Pamuk or a Murakami here and there are single swallows and not the summer. I think this barrier does exist. But could not cracks develop in this barrier—cracks that could widen? After all, it took some effort for Latin American literature to break through. There was a time when little Latin American fiction was published in the U.S., and mostly by academic presses. It was only in the 1960s that the Latin American novel achieved global prominence. Publishers, translators, critics—they all played a role. The socio-political context was also a factor: with the rise of dictatorships, tumultuous mass movements, and guerrilla struggles, Latin America’s profile expanded on a world scale. Is not the greater interest today in China and India, for a different socio-political context, something that could contribute to increasing interest in South Asian literature in translation? Limited though it might be, we are seeing translated titles being published from Japan, China, and Korea. Another simpler hypothesis is that our translations are not read because they are bad and not in international English. I always hear people say that most translations are not very readable. It is only our students of South Asian lit who we make read these novels but the mainstream never does. The question of readability and authenticity will always remain alive in the context of our translations. How do we deal with it? I believe this situation is changing. Though not as many as we would like, there are translators producing strong works. Their success can encourage the emergence of others. The key role will fall on the shoulders of translators. If we want to make a substantial dent, we will need to bring forth more excellent translators working from the languages of the subcontinent. I would say that even in India, the market has been pretty uneven and there are languages such as Gujarati which just do not see a lot of traffic into English. (I won the Katha Translation Award in 1996 for translating a Gujarati short story.) The pertinent question is perhaps not even the lack of literary translators but the fact that there may be a lack of suitable publishing opportunities for translations. I am willing to go the extra bit, putting my late nights and weekends translating Hindi and Gujarati literature into English. And there’s quite a rich treasure waiting to be unlocked. But am I going to get a ‘visible’ publisher? When I took on the translation of Bangladeshi writer Mahmudul Haque’s Kalo Borof, I had no sense of who would publish it. I had published a few translations in the literature page of Dhaka’s Daily Star. And later I would publish one at Words Without Borders. For translators, it’s important to persist with the efforts to establish a publication presence. Today there are more literary outlets worldwide that are open to translation. 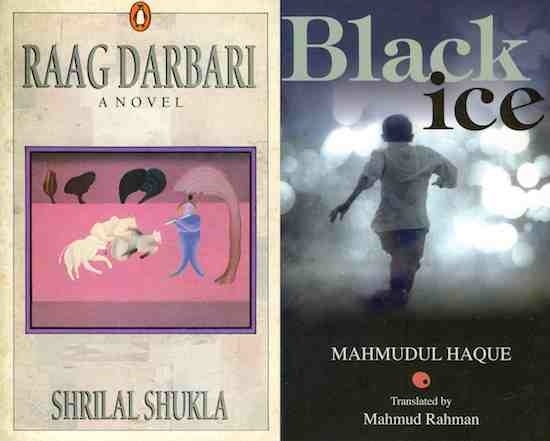 When my translation of Haque’s novel (now titled Black Ice) was ready, I began searching for publishers in Delhi. One thing led to another and HarperCollins accepted the title. I believe a strong work, capably translated, will find a publisher, at least in India. As for outside, that remains a challenge. Another aspect that could be explored is the psychological aspect of why someone from Kannada speaking background would be inclined to read a work translated from Sindhi or Pashto? Also it would give us an interesting window into the South Asian mindset if you were to look at a comparative picture – within the South Asian context – of translations by non-South Asian authors vis a vis translations of South Asian writers. Do Murakami and Márquez not do well? How are translations being read in India today? I don’t know. Márquez is read not just in English translation; he’s been translated into the regional languages. I don’t know about Murakami. I suspect “global popularity” has a marketing effect, both among publishers and readers. While working on this series, I got a better sense of the translation scene in India; but it’s a vast subject, and I look forward to learning more. Mahmud Rahman was born in Dhaka, in what was then East Pakistan. He is the author of Killing the Water, published by Penguin India, and the translator of Mahmudul Haque’s Black Ice. He has an MFA in creative writing from Mills College. See his website here.